Share the post "Fibroid Symptoms"
I seem to be having some of the symptoms of fibroids, but I’m not sure if they are really fibroids. How can I know for sure? If you feel that you may have symptoms related to the presence of fibroids, visit your gynecologist (see Fibroid Symptoms). A fibroid is usually discovered during a pelvic examination. Many times, however, fibroids are only discovered while a physician is looking for something else—or simply are not discovered at all. If you feel that your symptoms may be due to the fibroids, it would be a good idea to see your gynecologist and notify him or her of your concerns. Ultrasound scanning enables physicians to distinguish these tumors. This diagnostic procedure can confirm the presence of fibroids when a woman has symptoms that raise suspicion of the tumors. However, because certain types of fibroids look similar to ovarian tumors, and the fibrous tissue can interfere with the sound waves, the ultrasound reading can be inaccurate. In this case, physicians may sometimes suggest a magnetic resonance imaging (MRI). An MRI is a standard imaging technique for evaluating fibroids because it provides a clearer image than ultrasound and can detect other causes of pelvic pain and/or bleeding you may be experiencing. 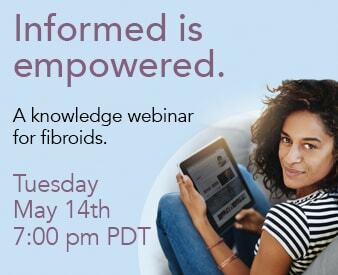 If you feel that you are experiencing fibroid-related symptoms and would like to learn about what steps you can take to find out if the fibroid actually exists, please feel free to contact the Fibroid Treatment Collective at 866-362-6463 or request a free phone consultation. We are always more than happy to provide you with useful resources and help you make positive choices for your health!